Happy Feast of the Bloggers! Since my proffering of St. Brigid’s cook St. Blath (pronounced Blah) didn’t pass muster, today we celebrate the man whom Catholic bloggers everywhere have acclaimed as their patron saint! He was a great scholar. He knew many languages. He fact-checked against original sources. He supported and was supported by fearless, scholarly and religious women. He successfully fought against the world, the flesh and the Devil. And dang, did he understand flamewars. 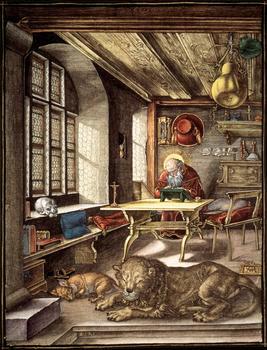 St. Jerome — we who are about to blog, salute you! Pray for us now, and in the hour of our thinking it’s a good idea at the time. Give us your blessing, and drop a clue-by-four on our heads whenever we need it. Like you, saint and curmudgeon, may all our combativeness and words help us fight our way through to the Word made flesh, and may all our wandering and pilgrimages lead us to the Way. We ask also for the prayers of your patient friends, St. Paula and St. Eustochium, that we may be both patient friends ourselves and patiently befriended. Patron saint of translators, pray for all of us crazy people who try to translate things, whether for a living or for fun, that our work may draw people together and teach them something of the truth. Pray also for the writers of translation programs, especially Babelfish, because they really are a help to folks. St. Jerome, aka St. Hieronymus. How did I not run into Speculative Catholic before? It’s always instructive to read phonebooks. Especially ones from North and South Dakota, with all those little towns’ itsy-bitsy white pages. Aadnes, American Horse, Antelope, Ayutapi, Azure. Bad Heart Bull, Basaraba, Baumstarck, Bear Catches, Beitelspacher, Berreth, Big Bear, Big Eagle, Binfet, Bjerkness, Black Cloud, Black Fox, Black Moon, Blackhoop, Blue Earth, Blue Thunder, Bobtail Bear, Bonogofsky, Bovkoon, Brave Bull, Brekke, Brown Otter, Bubbers, Buchfinck, Buffalo Boy, Bullhead. Carry Moccasin, Charging Cloud, Chase Alone, Chasing Bear, Chasing Hawk, Cheauma, Chiapputi, Crow Ghost, Crowshoe, Czapiewski. Dammel, Dog Eagle, Dogskin, Dralle, Droog, Dumdie. Eagleshield, Ebach, Eisenbraun, End Of Horn, Enzminger. Fallgatter, Fast Horse, Flying By, Flying Horse, Follows The Road, Fool Bear, Four, Four Swords, Fourbear. Gabbard, Gangl, Gazette, Glerup, Goldsack, Good Iron, Good Left, Grindstone, Guggolz. Hairychin, Haraseth, Has Horns, Hatzenbuehler, Hetletved, High Elk, Hillius, Hilsendager, Hoisington, Holy Elk Face, Hosie. Incognita, Iron Boulder, Iron Cloud, Ironroad, Ironshield, Iszler. Kadlec, Kaffar, Keepseagle, Kills Pretty Enemy, Klindworth, Klundt, Knispel, Kooker. Lafromboise, Lamsters, Left Hand, Limesand, Long Feather, Looking Back, Looking Horse, Lukesh. Mad Bear, Makes Him First, Many Horses, Manywounds, Marlenee, Mauai, Mayforth, Molash, Morlock, Muggli, Myllykangas. Peerboom, Peyerl, Pipe Bear, Plenty Chief, Pulst. Rainsberry, Red Tomahawk, Redlegs, Rising, Rising Sun, Rosebud, Rough Surface, Round Tree. Schurhamer, See Walker, Sees The Elk, Shoestring, Situpiska, Skwarok, Soete, Spotted Horse, Szczur. Taken Alive, Three Legs, Thunder Hawk, Treesoul, Treetop, Turgeon, Turning Heart, Two Shields. Uhde, Uses Arrow, Uses Many. Vaaler, Vachal, Valandra, Vavra, Vilhauer. Wakole, Weispfening, White Lightning, White Mountain, White Temple, White Twin, Wingire, Wise Spirit, Wruck. Yarlott, Yellow Bird, Yellow Earrings, Yellow Fat, Yellow Hammer, Yellow Lodge, Yineman, Ylitalo, Younker. Zbasnick, Zeeb, Zimbro, Zinke, Zuther. I should probably explain that this song doesn’t come from firsthand experience. However, it does come from personally watching too many of my friends do their best to mess up their lives and futures. And for what? If their boss treated them like this, they’d never have stayed a week! You lived your life around their plans. And you know what that reminds me of? Plenty easier ways to be had. The fast food of love. You had to work two jobs to eat. And you got burned constantly. ‘S why I don’t work there anymore. Let’s see if Blogger will let me put this song up this time…. But now here’s a nice little article on him. (He’s still alive! Yay!) More importantly, here’s his website, with reprints of some of his old novels and a good few new ones. (Even more yay!) I’m not sure if this JRR Tolkien: Myth, Morality and Religion is the same as Lord of the Elves and Eldils or not. (And you really don’t want to know how many years of looking through used bookstores it took me to get a copy of that one.) I imagine it must be much expanded, if not wholly different. And if anybody needs a DAW copy of The Parallel Man, I’ve got two. I’ve been reading The Dialog of St. Catherine of Siena from CCEL for a public domain audiobook (for Maria Lectrix and archive.org‘s Open Source Audio/Spoken Word section). It’s pretty interesting. (And with those run-on sentences, it’s a lot easier to read out loud than by eye.) But I’ve also been learning a lot. For some reason, I really liked the explanation of how all sins are against the neighbor (yourself being your chief neighbor), either by commission or by omission of gaining grace, which would let you help your neighbor more. Also, it’s strangely relaxing it is for someone as nitpicky as me to get reminded that other people, and God, are even nitpickier about sin — and yet we get delivered from our sins. Finally, I’m pretty sure St. C is the ultimate source of Mark Shea’s “Sin makes you stupid”, since she pretty much says that about the “eye of the intellect” in a more lengthy way. I’m not sure what else to say about the book, though. It’s got a lot of meat in it that I’m still chewing on. I’m currently in the middle of “The Book of Discretion”, and boy, do I need it. For example, I probably should just accept seeing a tiger in the middle of a display of African animals. And I did manage not to freak out like a flame war in Mark Shea’s comment box, or anything like that. I told the proper people; the proper people refused to change the display; and I guess I just have to accept it with as much love and grace as I can muster. Nobody is going to budge on this, so making more fuss would just make things worse. After all, it’s just a silly little display, and it’s coming down very soon. E pur si muove. Dang it. Still, there’s a difference between concern for the truth and intellectual pride, and I’ve got enough of the latter that I can’t really assume I’ve got the former.